Hosting holiday gatherings should be a time of joy and celebration, focused on spending quality time with your guests and not on cleaning, organizing or worrying about meal preparations. Remodeling your kitchen with a walk-in pantry is a great way to ensure your gatherings focus on the important things this holiday season. According to a recent U.S. Houzz Kitchen Trends Study, pantries are a popular feature to focus on in the kitchen, from built-in cabinetry (with 41 percent adding this item to their remodels), reach-in pantry closets (17 percent) and creating walk-in pantries (10 percent). A recent article on Decorated Life detailed this growing trend of smart, easy-access, functional kitchen pantries that are being added to existing spaces, expanded or custom built. When deciding the design of a walk-in pantry, features to consider include: function and storage, appliance and electronic storage, prep areas, sinks, refrigerators and overall style to maintain consistency with the rest of the kitchen layout. 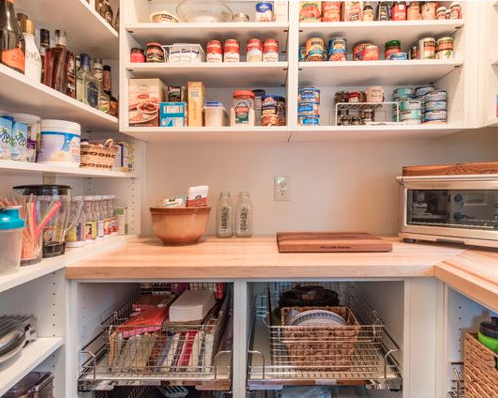 Walk-in pantries are back…in a big way! Not only do they assist in storing and organizing food, china and glassware, but many homeowners are also finding them to be a more convenient place to store small appliances and beverage refrigerators. Some trending large pantries even have sinks installed. Add a toaster and a few other small appliances, and you can also create the perfect spot for a morning coffee-tea-bagel station. When it comes to hosting festivities, walk-in pantries keep your countertops clean and clear as everyone gathers in the kitchen (as they always do). Enjoy the organization and the time spent with your guests this holiday season. Then, schedule a free consultation with our team to start your kitchen remodel in time for the holidays.